What did you find for Ruby Tuesday this week? Nice choices...I'm really fond of the ornate designs I'm seeing at the book store. Just the items for recording and keeping my favorite haiku! What a pretty little notepad. Maya would love that, she has a real thing for sweet little notepads. the note pad looks so eye-catching and it matches well with the pen. I'm always having to refrain from buying too many. I've always loved pen and paper. Very pretty! I'm sure it makes anything that you have to write all that much more special! Nice reds and contrasts, and I like the design. What a pretty notepad. Happy RT! I really like that cover on the pad of paper! The note pad would make a great Valentine's Day gift for my oldest daughter! A beautiful pen and pad set. I have a drawer full of half used note books, bought only because they were so good looking. I'll switch to note pads on the double. Looks like an Indian pattern, very beautiful ! Very nice photo, Mary. Isn't it fun to find red everywhere? Thank you for this meme! Poppy flowers for my entry...red is always beautiful! 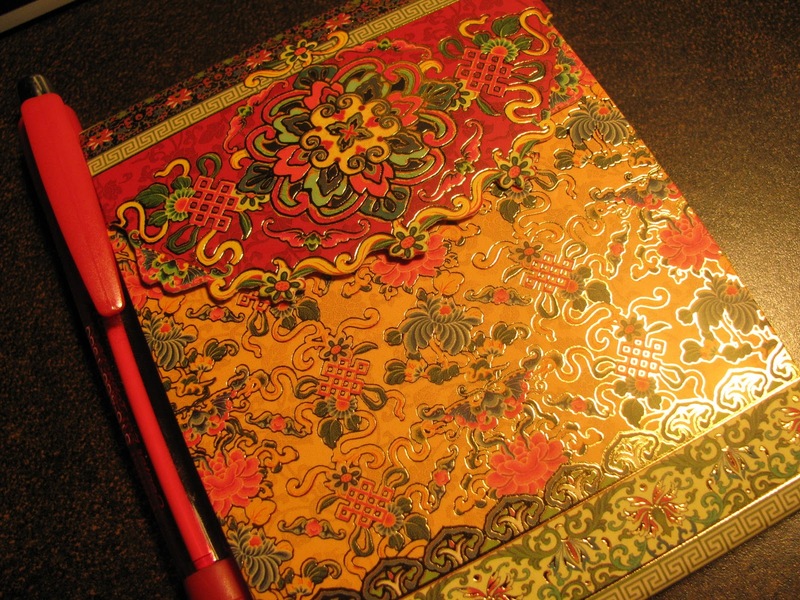 This is a gorgeous print... is it a blank paper pad or a journal? Wouldn't that look spectacular in a fabric print on a journal? Mary....I am so sorry I messed up with the Linky and ended up posting the entire URL....guess I was having another one of my senior moments. If you can correct it, that would be wonderful. I love that note pad and pen you found at Barnes and Noble. Sadly we have to go 60 miles to get to one. That is a very pretty set! 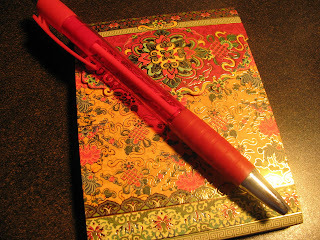 oh..i love notepads and ballpens and this one is really nice. happy RT! the designs reminds me of the coming chinese new year. What a cool, cool pad Mary. I love it. Perfect for RT. 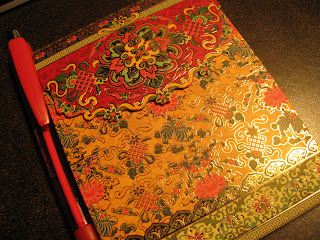 That looks like a lovely red oriental note pad, Mary... a perfect post for the lunar new year! Kung Hey Fat Choy to you! So so nice, its perfect for the Meme. here with my entry this week. a bit late but glad i am able to submit m entry. btw, nice pen. would love to have that. cheers! Lovely design and delightful blend of colours on the little notepad! A great find! Lovely not pads. I wouldn´t mind to have one. came by to join ruby tuesday! have a wonderful one. Scrumptious. It looks like brocade. Your little note pads are absolutely lovely! I have one too and it's pure pleasure to use it! 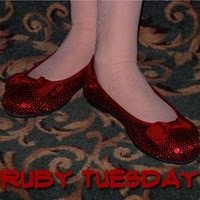 Love the notepad and all of the other "Ruby Tuesday" post! I bought that very item when I saw it in the holiday season. Very very nice. That would make writing something very enjoyable ! Sorry i got 3 similar posts please delete the two sorry for that. Real PINAY Blogger, thanks a lot.